So after too many trailers and a lot of hype Godzilla has finally arrived and I was left pleasantly surprised with how not terrible the film was. To give some context before I go on with the review, I have been a huge fanboy when it comes to the classic Godzilla movies, yes even the ones where you have Godzilla dancing or talking in his weird voice, the nostalgic love I have for the old films is there. So going into the new Godzilla I was apprehensive, would my nostalgia make me not be able to enjoy the new vision that Gareth Edwards has or will the movie just generally be bad? Well I’m happy to say that though the movie isn’t brilliant it is a good movie, one that I’d be happy to recommend to fans of the large city destroying monster. As with every film though there are of course pros and cons, some of which may turn you off to the film. I want to start by talking about the weakest part of the film and that is the human story that you the audience follows for the majority of the film. To put it bluntly the human aspect of this film is dull, we find ourselves following Aaron Taylor Johnson (best known for Kickass) as ‘Ford Brody’ though he is a competent actor he just doesn’t have the presence on screen to have you caring about what is happening and you will also find yourself caring less about his wife and kid who he so desperately wants to get back to, these characters are so under developed I found myself switching off most of the time they appeared on screen. It is also important to add that if you are going to see this film so that you can get you’re Bryan Cranston fix then this probably isn’t the film for you as apart from a scene stealing monologue he isn’t in the film enough to warrant going to see it. I also have to focus on one aspect of our lead character and the nickname I found myself giving him which is “Convenient man”. Too often in the film I found myself saying “Oh that’s convenient that he was there to deal with that problem”, it became a little ridiculous after a while at how our lead character seemed to pop up in the right place at the right time so as the plot could slowly lead us to where we needed to be, it just felt lazy and frustrating after a while. Now though I want to get onto the important part of the film and this review and that is of course Godzilla. 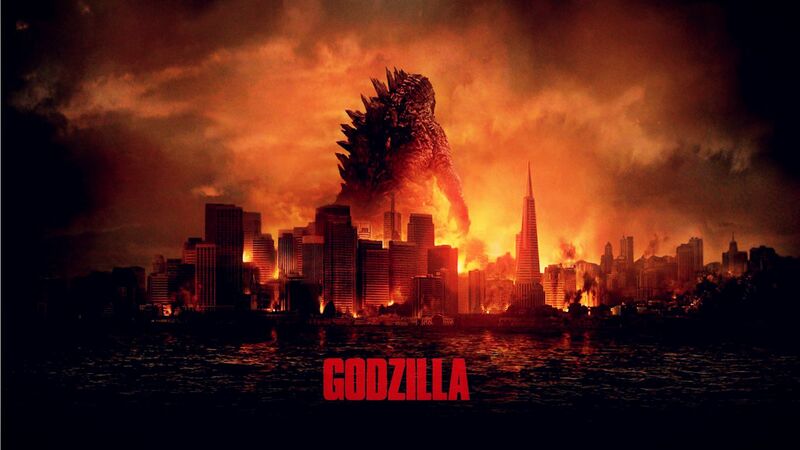 Like the film I have decided to make you wait a while before getting that Godzilla goodness. Yes if you go to see the film don’t expect an onslaught of Godzilla instead what you’ll get is a Jaws like experience where you won’t see the monster for a very long time and if you do it is just quick glimpses. Now this decision is annoying a lot of people who have seen the film, saying that the Godzilla film has no Godzilla in it. I disagree because having the audience wait so long before getting their Godzilla fix works well for the final third of the film which is some of the most badass monster destroying you’ll see in a while. Every second that Godzilla is on screen is like a little treat and as his screen time increases the better it gets and by the end of it all you feel like you have certainly got a hefty fill of the monster. I also must add that the visual effects in this film are phenomenal, there were genuine moments of awe as Godzilla bounded his way through San Francisco etc. This is a film that I would definitely say is worth seeing in the cinema if not just to see Godzilla towering over everything. So yes Godzilla isn’t a perfect movie, the human aspects are boring and sometimes tedious and the film probably could have had its running time shortened a little bit but I would say it is all worth it to get to the Godzilla moments, The director Gareth Edwards did a great job of bringing the Godzilla we know and love back to the big screen and I would definitely recommend this film to people for that point alone.